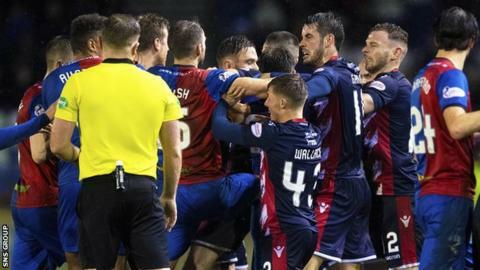 Inverness Caley Thistle and Ross County have each been fined £2,500 by the Scottish FA following a melee during the last Highland derby. Angry scenes followed a tackle by Brad McKay on County winger Michael Gardyne in the Scottish Cup replay on 19 February. The game finished 2-2, with hosts Caley Thistle prevailing on penalties. The Championship rivals made their cases at a SFA hearing last Thursday before the punishment was announced.